Tracksounds: Let the Hobbit Hype Begin! Let the Hobbit Hype Begin! Just as things were getting unbearably boring...EMPIRE magazine comes to the rescue. Aside from the mediocre level of WATCHMAN hype, there really has been very little movie buzz this year. Granted. The year is young, but if you think back to last year, we were in the midst of post-CLOVERFIELD euphoria (aka motion sickness recovery) and well into THE DARK KNIGHT's viral hype machine. Now...finally...here's something to get some anticipatory-juices flowing again. 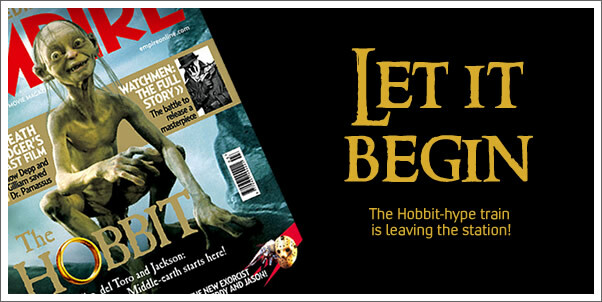 This months' EMPIRE magazine covers, among other films, Jackson and Del Toro's upcoming film, THE HOBBIT. I haven't gotten a copy yet, but I look forward to diving in to it...with hopes that they will touch on the film's original score by HOWARD SHORE. Good call, G. Good call.